Microsoft added new features to Outlook.com on Tuesday, making its email client look much more like Gmail. The updates include new ways to filter and organize emails, an undo function, in-line reply and improvements to chat. The software giant has been trying to lure more users to Outlook.com (previously called Hotmail) in recent months. Late last year, Microsoft added a feature that allows Gmail users to seamlessly import their accounts to Outlook.com. Outlook.com's biggest change is the addition of Advanced Rules, which enables users to set custom triggers to help them organize their inbox. Triggers can be based on how old a message is, who it's from and whether the message is unread. For example, you can set a rule that moves messages more than three days old, and were sent by one of your contacts, to the the top of your inbox. "With Advanced Rules, you now have more control over how your emails are sorted, filed or bumped to the top of your inbox," Mike Schackwitz, Outlook.com's lead program manager, said in a blog post. "You can create multi-condition and multi-action rules, and set your inbox to organize itself automatically." 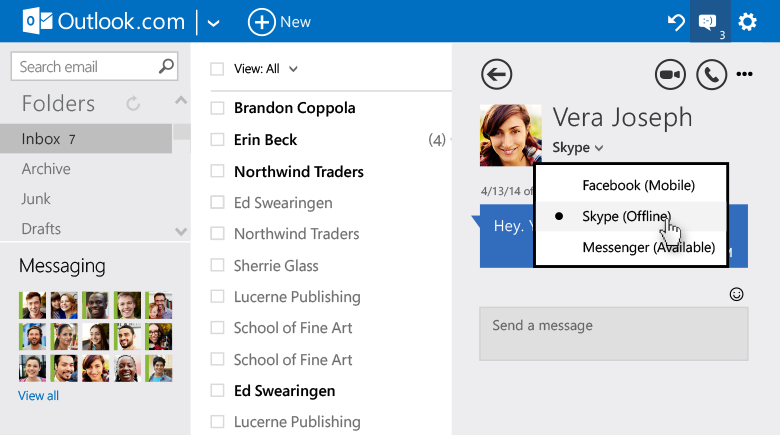 Microsoft's new Advanced Rules lets users set custom triggers for how emails are filtered. Chat has also been improved to make it easier to send messages, and to find friends online. Outlook.com now contains a messaging section at the bottom-left corner of the inbox, where users can find their recent conversations, and see which of their contacts are online. What's more, users can also send messages over Skype, Facebook or Messenger, and switch between the three options, from within Outlook.com. Microsoft added a messaging section to Outlook.com where users can find their recent conversations and see which of their contacts are online. The new Outlook.com makes replying to messages a lot easier by adding in-line reply. Previously, users couldn't respond to emails without opening a new view. Microsoft also added an undo button (ctrl+z works) that allows users to undo certain actions, including delete, categorize, flag, mark as junk or move. The new features will be rolling out gradually over the next few weeks.